Earlier this year I had the pleasure of attending a course called Train Smarter and Harder, taught by Dr. Tim Gabbett. Dr. Gabbett holds a PhD in Human Physiology and another in Applied Science of Professional Football (that’s non-American football). With over 20 years of experience, he has worked with elite collegiate and professional athletes worldwide including Olympians and Commonweatlh Games competitors. A prolific researcher, he’s published over 200 peer reviewed articles on various topics including acute/chronic workload ratios (more on that later), athlete monitoring, rugby, Australian football, basketball, volleyball, handball and more. As a highly-sought speaker who has presented at over 200 conferences around the world, I jumped at this opportunity to attend his seminar here in NYC especially since he makes his home all the way in Australia. The following will be a brief course review of some of his main talking points as well as some of my thoughts on how this can be applied to reducing the risk of injury in the sport of powerlifting. Currently, we unfortunately don’t know much about “preventing” injuries per se when it comes to competition and training for sports, but as clinicians who work in sports rehabilitation we can try our best to reduce the risk of injury by combining what we know about musculoskeletal health with the available body of research on the topic. I wanted to attend Gabbett’s course as I understood some of his research sought to quantify specific workloads that athletes could perform which could inform varying degrees of relative injury risk. Could there actually be an objective way to determine how much training is too much training? Can you analyze an athlete’s current training program and with some measure of reliability estimate whether he is putting himself at risk for injury or protecting against it? What metrics do you even look at?! In researching some potential answers to these questions, Gabbett made some modifications to an athletic injury etiology model (see Figure A) originally designed by Meeuwisse et al, 2007 depicting the multifactorial, non-linear nature of athletes’ injury risk. Suppose you’re an athlete with a certain level of injury risk, based on history of injury, factors you can control (aerobic capacity, strength, motor control) and factors you can’t control (age, bony anatomy, genetics). Your training program for your sport consists of resistance training, cardiovascular training, sport-specific skill practice and more. All these things are examples of stimuli which impart load, or work performed in preparation for your sport. Workload is the “cumulative amount of stress placed on an individual from multiple training sessions and games over a period of time.” (Gabbett et al, 2014). Ideally, you perform your training well which yields positive, physiological adaptations that contribute to your fitness. Naturally, experiencing fatigue is a part of this process. The net balance between managing your fitness and fatigue influences your internal injury risk factors in either a positive or negative way, and of course you want fitness to exceed fatigue in order to yield healthy performance. When we do occasionally experience injury and undergo recovery/rehabilitation, we continue to impart workload and remain in the cycle to (hopefully) drive more positive physical adaptations that result in healthier, improved sport performance. 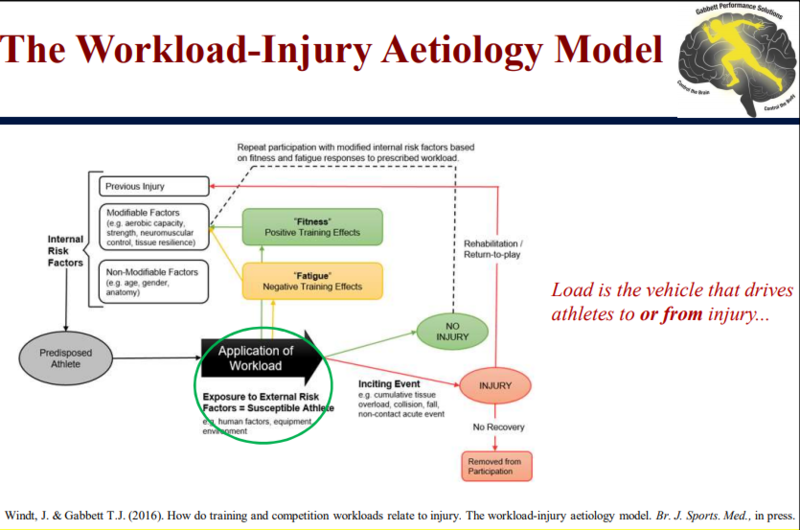 As you can see from Figure A, load is the vehicle that drives athletes to or from injury. As Gregory Lehman has similarly stated, load is both the poison and the antidote. When a tissue’s capacity to tolerate load is exceeded, it results in injury. But a healthy, tolerable loading dosage actually promotes resilience and decreases the chance of fatigue leading to injury. A key principle here is that even when you’re injured, your body needs to undergo some degree of loading to eventually recover and be healthy again. Another related model on the relationship between load capacity and performance by Verhagen, 2018 mentions how temporal factors such as context and environment can heavily influence the balance between the two. Things like fatigue, stress, mental state, emotion and motivation can drastically change how your body responds to a given load from day to day. Gabbett’s research on the Acute:Chronic Workload Ratio (ACWR) has been a popular podcast topic over the past couple of years as it has been proposed as a model to objectively measure an athlete’s readiness (or lack thereof) to train. In its most simple terms, it can be measured by dividing the amount of workload of the current week by the average workload of a longer period of time (usually 4 weeks). One method of calculating workload is to multiply an athlete’s reported RPE (Rating of Perceived Exertion) by another metric of a bout of training, such as duration. For example, on Monday an athlete performs a 30 minute bout of training with an RPE of 5; on Wednesday, a 45 minute bout at RPE 6 and on Friday, a 60 minute bout at RPE 7. Let’s say this this is a typical week of training, so the sum of the week’s workload is 840 arbitrary units (AU). Let’s also say the athlete does this for four weeks, which puts the chronic workload at 840 AU. Now, let’s say in the fifth week this athlete participates in a competitive three-day tournament in which he competes for 60 minutes at RPE 8 each day. His acute workload for this week is 1,440 AU (480 AU x 3). The ACWR in this scenario would be 1,440/975, or 1.71. Gabbett’s research suggests that certain athletes whose ACWRs exceeded 1.5 experienced injuries at rates as high as 2-4x greater than athletes whose ACWRs were < 1.0. Additional research which observed ACWRs and injury rates among cricket, rugby and Australian football players suggests that 0.8 to 1.3 is an ideal ratio range to minimize injury risk. The graph above shows these zones on a graph that depicts these ratios as a training “sweet spot” to aim for and a training “danger zone” where risk is elevated. As a powerlifter & physical therapist I’m pretty fascinated with the concept of estimating and quantifying injury risk in the way Gabbett has done, and the degree to which these calculations can be applied to barbell sports. Gabbett’s work and research was performed exclusively in field sports such as football, rugby and cricket where measuring internal load through the athletes’ self-reported RPE was probably the most practical and easy way to estimate load. But how about a sport in which there are very objective measures of external training load, such as sets, repetitions, weight, bar distance traveled, time under tension and bar velocity? RPE exists as an effective proxy for training intensity in the context of programming and load selection purposes, especially given the potential day-to-day or week-to-week changes in a lifter’s readiness. But after your training sessions if you have all this objective data from your lifting performance (literally the weight you lifted that was on the bar) I think it could also be helpful to infer injury risk models from that. A lot of the principles that were taught in Gabbett’s seminar described the foundational tenets of progressive overload in powerlifting programming and strengthening and conditioning for the long term in general. Impose physiologic adaptations upon the body through gradually increasing amounts of work over time, paying attention to spikes in workload that the athlete may not necessarily be prepared for. The more data you accumulate over time, the better idea your coach has about how your body responds to different parameters of training and the more effectively able you’ll be able to elicit desired adaptations from different zones of training, which each have different indications. There was much emphasis in the course of building a strong foundation early on in the athlete’s “season”, or establishing a robust chronic workload base to better enable you to take on greater microcycles of intensity or volume later on, especially as you near the end of a training block or approach a testing day for a heat check. If you zoom out even further on an athlete’s training life, having a long training age (say, a decade or more of experience in effective strength training) your body may be even more prepared to take on voluminous macrocycles with less health issues than your less-experienced counterparts. Measuring ACWRs are basically ways to quantify the maximal recoverable volume (MRV) for an individual lifter. While I don’t think that there exists a specific ratio for all lifters to keep underneath (as some evidence suggests that 1.5 is that special number for for rugby, cricket, Australian football players and perhaps similar field sport athletes), the ACWR can be another numerical tool to inform coaches about their athletes’ current readiness based on recent historical performance in the short term and medium term. There will be different ratios between different lifters, and also potentially different ratios within a single lifter depending on type of lift (squat vs. bench vs. deadlift) and training intensity zone. For example, I think it would be more accurate to measure an ACWR for the deadlift which is separate from the bench press. And take the squat for example, a novice or intermediate lifter may have a lower ACWR ceiling for intensities at 90% 1RM and greater, but has a much higher MRV between 65% and 85% 1RM. There are myriad ways to make these calculations and observations. I’ve created this sample spreadsheet to help coaches and lifters calculate and monitor ACWRs. Once you access it, go to File and Make a Copy of spreadsheet so you can edit the document and enter in your own values. Feel free to make a copy for every lift you’d like to measure your ACWR (i.e. separate sheets for squat, bench press and deadlift). The values you see in the sample I’m providing below are my squat volumes for one of my final blocks leading into last year’s Raw Nationals in Spokane, where the majority of my squat intensities were at 90% or greater. My squatting frequency was 2x/week during this block. The next two sections calculate your Average Weekly and Average Daily Volumes, and from that you can see your ACWR by week and also by day. You can use these charts to see trends in your week to week and day to day progressions. Notice that my volume started off high and gradually decreased. While my intensity data is not shown, it increased gradually through the block. My ACWR also decreased as I progressed through the block which suggests that my risk for injury decreased even as I was peaking. In my final week leading into Spokane I hit my squat opener and some lighter back-off sets. I entered my volume for one squat day and also on the week into the blue cells to calculate my ACWRs for this last week, which were very low (as they should be leading into competition). I found Dr. Gabbett’s course to be very informative and helpful. 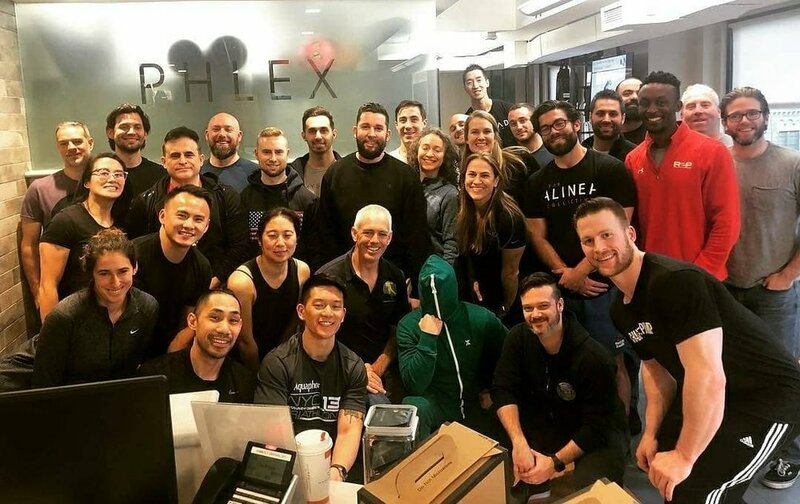 The course attendees consisted of physical therapists, strength coaches and personal trainers, many of whom also coached various sports such as gymnastics, track and field, basketball and more. Throughout the course, we broke up into small groups and discussed programming scenarios for different sports while calculating ACWRs for each one. While I think the course would be most helpful for PTs who work primarily in sports rehab settings or who see mainly athletes, there’s definitely a lot of content that physical therapists could apply to general populations as well. Earn the right to push yourself hard in training by first preparing your body to tolerate the loads you’re going to place on it. Establish that foundational base first and maintain a robust chronic workload. If you go ham all the time in training without locking down the training prerequisites first, you’re putting yourself at risk for injury. There’s a lot of therapeutic benefit in applying these concepts on individual joints, specific body regions and frequently used movement patterns that experience recurrent injuries or dysfunction. Recognizing and diagnosing these as well as focusing rehabilitation specifically on those joints/regions/patterns through smart loading management is a crucial aspect of sports rehabilitation. Dr. Gabbett is a great speaker and even with dozens of people approaching him during breaks and after the course with very sport-specific, esoteric questions, he was always patient and willing to engage in conversation with you. Would highly recommend this course. 1) Bourdon, P.C., Cardinale, M., Murray, A., Gastin, P., Kellmann, M., Varley, M.C., Gabbett, T.J., Coutts, A.J., Burgess, D.J., Gregson, W., Cable, N.T. (2017). Monitoring athlete training loads: Consensus statement. International Journal of Sports Physiology and Performance, 12:S2161-S2170. 2) Gabbett, T.J., and Whiteley, R. (2017). Two training-load paradoxes: can we work harder and smarter, can physical preparation and medical be team-mates? International Journal of Sports Physiology and Performance, 12:S250-S254. 3) Malone, S., Owen, A., Newton, M., Mendes, B., Collins, K., and Gabbett, T.J. (2017). The acute:chronic workload ratio in relation to injury risk in professional soccer. Journal of Science and Medicine in Sport, 20:561-565. 4) Quarrie, K., Lambert, M., Mellalieu, S., Gabbett, T.J., Gray, A., Hennessy, L., Stadelmann, J., Fuller, C., Gill, N., Blackie, J., Kemp, S., Cook, C., Nicol, R., and Raftery, M. (2017). Managing player workload in rugby union. British Journal of Sports Medicine, 51:421-427. 5) Nassis, G.P. and Gabbett, T.J. (2017). Is workload associated with injuries and performance in elite football? A call for action. British Journal of Sports Medicine, 51:486-487. 6) Gabbett, T.J. (2016). The training—injury prevention paradox: should athletes be training smarter and harder? British Journal of Sports Medicine, 50:273-280. 7) Hulin, B.T., Gabbett, T.J., Caputi, P., Lawson, D., and Sampson, J.A. (2016). The acute:chronic workload ratio predicts injury: high chronic workload may decrease injury risk in elite rugby league players. British Journal of Sports Medicine, 50:231-236. 8) Hulin, B.T., Gabbett, T.J., Caputi, P., Lawson, D.W., and Sampson, J.A. (2016). Low chronic workload and the acute:chronic workload ratio are more predictive of injury than between-match recovery time: A two-season prospective cohort study in elite rugby league players. British Journal of Sports Medicine, 50:1008-1012. 9) Hulin, B.T., Gabbett, T.J., Blanch, P., Chapman, P., Bailey, D., and Orchard, J.W. (2014). Spikes in acute workload are associated with increased injury risk in elite cricket fast bowlers. British Journal of Sports Medicine, (in press). 10) Hulin, B.T., Gabbett, T.J., Blanch, P., Chapman, P., Bailey, D., and Orchard, J.W. (2014). Spikes in acute workload are associated with increased injury risk in elite cricket fast bowlers. British Journal of Sports Medicine, (in press).